Spring has sprung and that means that it’s not only time to change the way we dress and feel, it’s time to switch up what we eat and drink too! No more pumpkin spice lattes or heavy comfort foods needed. Spring/summer is all about light, fresh, crisp bites and beverages that refresh and energize you for the longer days that come with it! If you’ve ever read my recipe posts before, you know I’m not a leafy salad kind of gal. A bowl full of leaves with a few scrumptious ingredients sprinkled on top is just not going to cut it for me. Those scrumptious ingredients are the best part (not to mention, they’re also typically the most nutritious) so I tend to skip the lettuce when creating my own salads at home. 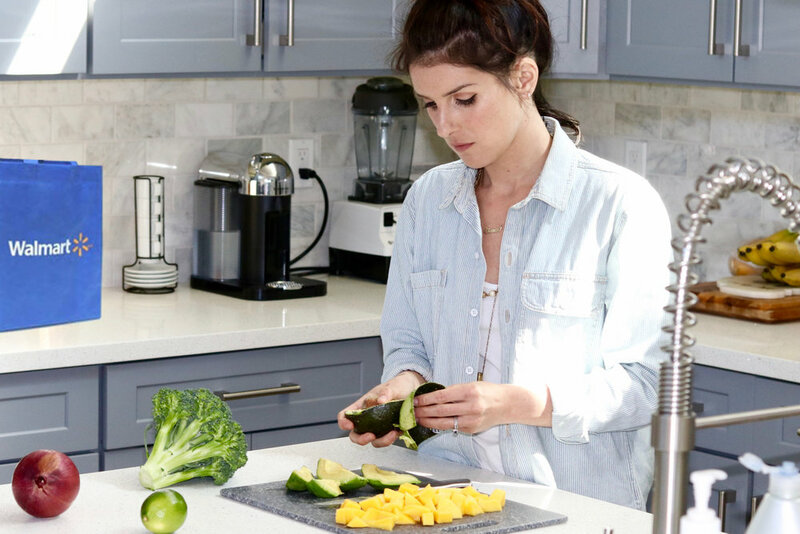 Making a nutritious, light lunch at home is something my husband and I like to do as often as our schedules allow. Even when one of us is working, we try to reconnect at lunchtime for a midday “reset” together. I married my best friend and no one makes me laugh, alleviates my stresses, listens and gives me the best advice and just generally lightens my load like he does. He truly is my partner in crime. Having even 30 minutes to release and reset from the first half of the day’s events is a great energy booster for taking on whatever the second half has in store! I do this with my husband but whether you share this lunchtime reset with a friend, your pup or simply enjoy it by yourself, I believe taking a moment to laugh, vent or zone out is crucial. Shaking off the morning in whatever way works for you and eating a nutritious light meal re-energizes you so you can focus on what needs to get done in the remainder of the day. When I eat too heavy or don’t take that moment with my husband, I really feel it when I’m trudging along into the evening. Getting home at the end of the night is always wonderful but it takes longer to shake off the weight of the whole day. If you’re a nonstop kind of person, like so many of us can be, try enjoying a carefree lunchtime reset and see the difference it can make for your daily experience. I don’t think you’ll be disappointed with this methodology or the delicious lunchtime recipe I have for you below! The first step to your lunchtime reset is always washing and drying your fresh produce. 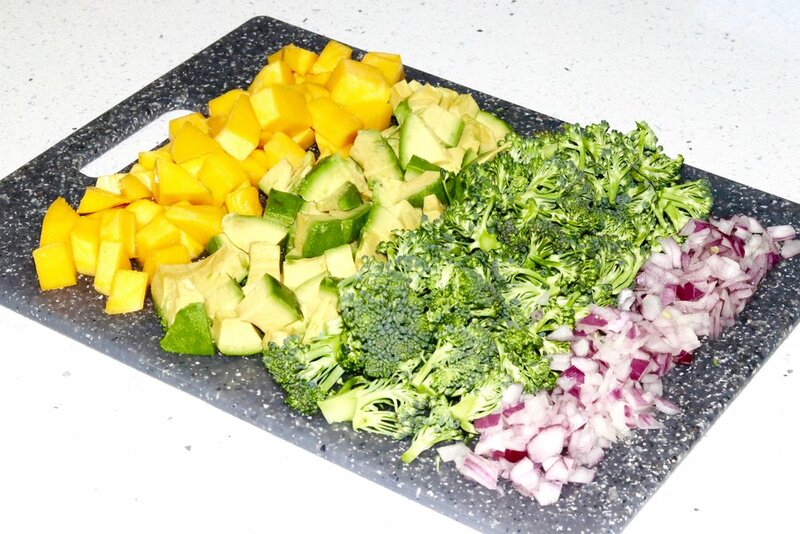 Proceed by chopping up the avocado, broccoli and mango into bite-sized pieces. Also chop and dice the red onion into much smaller than bite-sized pieces. Put these ingredients into a large bowl for mixing. Thinly slice your dates and add them to the bowl along with your sunflower seeds. Note: You can replace sunflower seeds with your preference of nut if you want a stronger crunch factor! While your cutting board and knife are out, quarter your lime in preparation for the final step of making the dressing. Squeeze two piece of the lime into a bowl with olive oil, mustard, honey and apple cider vinegar. Add salt and pepper to taste and stir well with a fork or small whisk if you have one handy. Taste the dressing and add an extra dash of honey if you want more sweetness or lime and vinegar if you want more tartness. Trust your own taste buds here! Add the dressing to your mixing bowl and toss to thoroughly combine and coat all of youringredients! 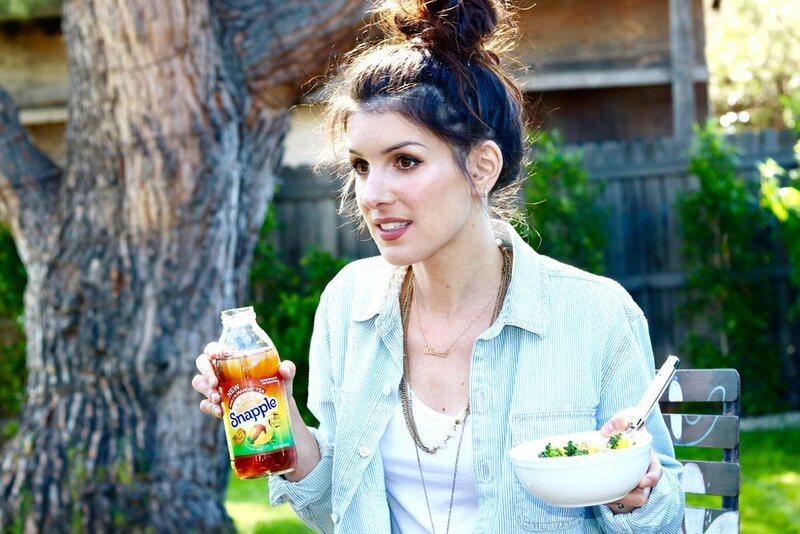 Serve up your salad with the perfect ice cold beverage pairing, Snapple® Takes 2 to Mango™ Tea! Snapple’s new flavor of iced tea actually inspired this lunchtime reset recipe because to me, nothing says “bring on the sunshine” like the delicious flavor of mango, and nothing is more refreshing than an ice cold Snapple beverage. You can pick up singles or multi-packs of the new Snapple Mango Tea at select Walmarts and if you have a Walmart Superstore nearby like I do, you can grab all the ingredients you need for this recipe while you’re stocking up on your new favorite Snapple flavor! This food and beverage pairing is the perfect formula for an energy-boosting midday reset. I know days can be hectic but it’s important to take some time for yourself to be the best you that you can be all day long!